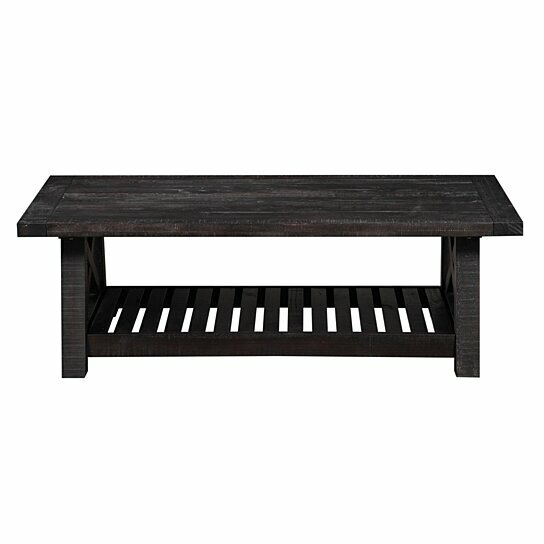 Complement your rustic, contemporary or industrial decor with this Coffee Table. The perfect pick for modern farmhouse aesthetics, it showcases a pine wood frame with a plank style top supported by two x-crossed sides. The brown finish and exposed hardware add a touch of industrial appeal to this table, while the lower shelf provides a convenient space to tuck away glossy magazines, media accessories, and more. Set this coffee table at the center of your living room and create a striking look in your home. Note: Other featured items in image except this Coffee Table are sold separately. The table is made from pine wood for durability and longevity. Exposed hardware, X-shaped sides and plank style top of this table will add a rustic farmhouse touch to your home.